It is extremely rare to find gold appliqué on precious hardwood furniture, with no extant examples recorded. However, the vigorous carving of the five-clawed dragons, the gold appliqué, as well as the now missing hall mark, would suggest an imperial provenance. 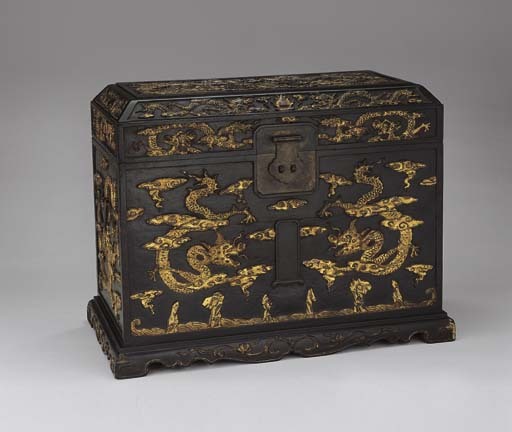 This exceptional Ming court chest of unusual large size closely resembles the lacquer pieces in the Qing court collection, but there are no published examples of zitan chests from the Ming dynasty in the Palace Museum or the National Palace Museum in Taiwan.